Summary: Aunt Frieda’s announcement that she’s coming to stay with Ben, his three sisters and his mother takes them all by surprise. It’s been years since Aunt Frieda’s nephew (Ben’s father) died, and no one knows exactly why she would want to visit now. But once they become accustomed to her, Aunt Frieda’s presence and easy nature begins to have subtle and positive effects on all of them. At a time when Ben is questioning what he knows because of his ongoing grief over the death of his father and the threat of physical violence at school, Aunt Frieda connects by telling him her own stories of hardship and pain. In the end, it’s up to Ben whether to fight back, or to choose another way. Review: Since his father died, Ben has been the only male in female-dominated household. Outnumbered four to one, Ben isn’t exactly enthusiastic about increasing the disparity with his Aunt Frieda’s visit. Though she is an older relative he doesn’t know much about, Aunt Frieda becomes a friend who challenges him to consider his actions and not fall into the trap of hatred when things start going badly at school and one of his best friends runs away. Ben is a complex character. While it’s clear he loves his mother and sisters, it’s also clear that having to live without his father has affected his life. While his passion for dance has been embraced by his family, school is another matter, and I can’t help but wonder if his father had been around whether he would have learned how to fit in better. At least then he might have also had someone better equipped to help him deal with potential self-esteem issues. But the great thing about Ben is that while he struggles, he shows a strength of character his own mother doesn’t believe he has. Thankfully Aunt Frieda does come to visit, because she and Ben seem to be two peas in a pod who intuitively understand each other. It’s a beautiful relationship across the generations, and Aunt Frieda seems to come at a moment when everyone needs her most. I love how Ben ends up rejecting a life ruled by pain and anger as a man of stone like the men in Aunt Frieda’s stories. I also enjoyed Ben’s introspective nature and how he can see others giving into something he refuses to choose. It’s powerful and thought-provoking, and I had several memorable quotes due to the nature of the book. My favourite part of Friesen’s story is how she uses dance as a metaphor for being yourself. As a child, Ben dances with abandon. He’s naturally talented, he’s passionate, and he doesn’t care what others think. Once the teen years strike though and the other kids start making fun of him, he hides his love of dance away and still has to put up with being called Ballerina Boy. But while he pushes his true nature down, there are glorious moments when it breaks free. When he’s on his own and then with Aunt Frieda, dancing is an integral part of who he is. And eventually, he learns to embrace his true self. Men of Stone has a wonderful voice and explores a family’s journey though grief with the help of a relative who knows what pain truly is. I loved it. 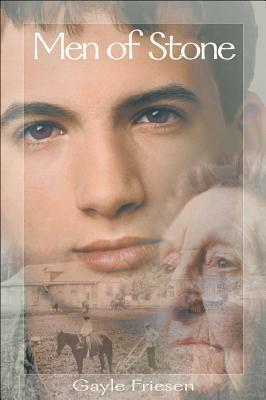 Men of Stone by Gayle Friesen is published by Kids Can Press, (2000).